Unless you are living under a rock you are likely aware that we are now experiencing what is known as a Mercury Retrograde. Unfortunately, due to commonly circulated beliefs and discussions about this auspicious astrological occurrence you give up your power during this time. 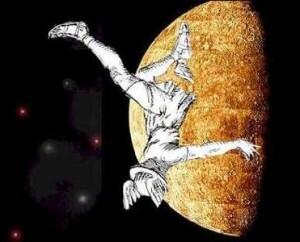 What is Mercury Retrograde really? The so called "effects" of Mercury retrograde is a BELIEF system. Don't believe it so much and it won't affect you so much. It really is that simple! You are believing in a negative belief system which generates 'fear based vibrations' in you which ... can naturally only attract like vibrations! Mercury only APPEARS to move backward, in fact, Mercury is not altering it's path at all. Humans have added a lot of interpretation and meaning to an illusion and created quite a lot of "noise" over nothing really. I can assure you Mercury does just fine during it's apparent retrograde and so can you. It's like anything.. what you focus on you get more of. What you expect, you get. The Energy vibration that you FEEL about anything shows up as manifestations with this Energy vibration in your life! Can you see that it's your beliefs and expectations that make the retrograde so daunting? Not the planet's motion! Since you are likely focused on and aware of the retrograde DECIDE that this period of Mercury (appearing to) move backwards will be one of ease, relaxation and good fortune for you! If you are a powerful creator of your life YOU create your life experiences, not a normal astrological occurrence. Did you know that more than 50% of the top Fortune 500 businesses were started under the Mercury Retrograde? Mercury Retrograde brings us a huge opportunity for Abundance and Success! Mercury Retrograde brings us the opportunity to get out of our heads and FEEL our life through our hearts. Learn more about the OPPORTUNITY for Success that Mercury Retrograde is. The energy of Mercury's retrograde brings an opportunity to tune into your more spiritual, connected and intuitive side. If you ignore these nudges now, the Energy will quickly show you that was not the most wise choice. However, if you pay attention - as the retrograde energy of Mercury asks you to - you will be rewarded with insight, guidance generating better results based on intuitively informed choices. Here's one of the better discussions about Mercury Retrograde from an astrologer. No fear based beliefs or warnings... just a lot of opportunities on how you can make the most of the special energy of this time. Visit here for an intelligent and constructive look at the opportunity of Mercury Retrograde. Take a look at the great animation on this page. You'll see how the illusion of moving backwards is created. It's Mercury Retrograde time... Let's ROCK!